Online Motorcycle Auction — Harritt Group, Inc.
No minimum. No reserve. Selling to the highest bidder. Full payment due within 24 hours. Cash, check or wire transfer. Title transfer immediate upon payment of cash or wired funds. Possession and title held for 14 days with payment by check for bank clearance. Born to be wild, looking for an adventure? Selling two American icons online with no reserve to the highest bidder. 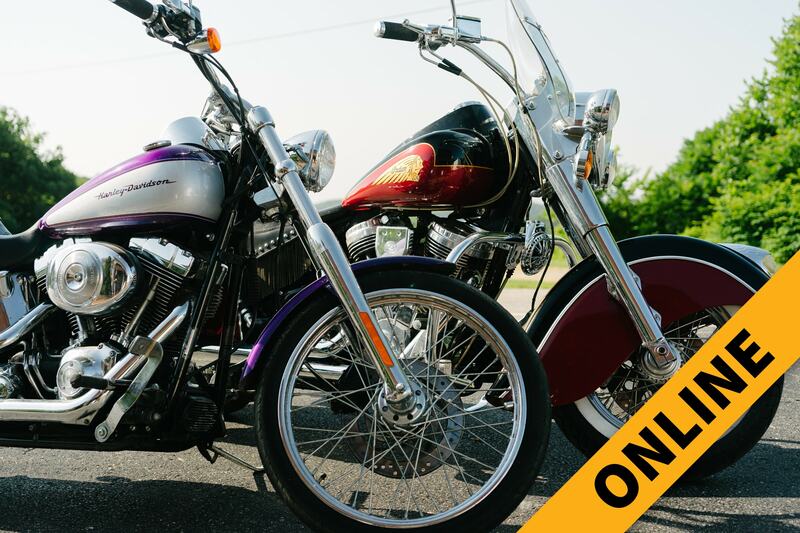 A 2002 Indian Chief Roadmaster motorcycle and a one-family owned 2001 Harley Davidson FXSTDI Softail Deuce motorcycle. Located in Edwardsville just off St. Rd. 62 – 1/2 mile from I-64 Georgetown Exit #118. Classic black and cherry colorway. The Indian Chief Roadmaster comes with the Power Plus 100 V-Twin 100 cubic inch 1600cc engine and was built in Gilroy, CA. This model features two up leather seat, leather fringe, guardian bell, windshield, whitewall tires, wire wheels and dual leather saddlebags. Recently upgraded with Vance and Hines exhaust pipes. Approximately 10,000 miles. Odometer in non-working condition, owner purchased the motorcycle in 2010 with 7,404 actual miles and he estimates he rode an additional 2,000 miles. Concord purple and silver colorway. The Harley Davidson Softail Deuce comes with the 1450cc V-Twin engine. This model equipped with factory installed anti-theft alarm, 21” laced front wheel, solid rear wheel, stretched fuel tank, full-length console, and additional mustang seat. 23,954 miles. Lots will end 5 minutes apart.